Who is this chick, anyway | I think in comics. 1. My name is “Vy,” pronounced like “Vee,” like the letter. Not “Vie.” Yes, I know that there’s a movie called “V for Vendetta.” I’ve seen it. I even read the comic, in fact. 2. I love comics with a burning fiery passion. 3. I am in fact in college, as a biology major, but I do not have any idea what to do with my life or what career to pursue. I don’t think “making craptons of money” counts as a clear-cut, tangible goal. 4. I’m still undecided between chocolate and cheese as “the greatest foods ever created.” Your thoughts would be appreciated on this one. 5. I own a Golden Snitch necklace that opens to reveal working clock. Along with other various items of geekery. 6. I fricken’ love my readers. Whenever I meet people, you know, in the real world, they’ll often sheepishly reveal to me that they “stalk my blog.” That’s what it’s there for! Read! Comment, even! Seriously, to hear people’s thoughts– and to know that people can actually enjoy my poorly-drawn tirades– makes it all worthwhile. BECAUSE IT WAS THE BEST MOMENT OF MY LIFE. Okay. Exaggeration. 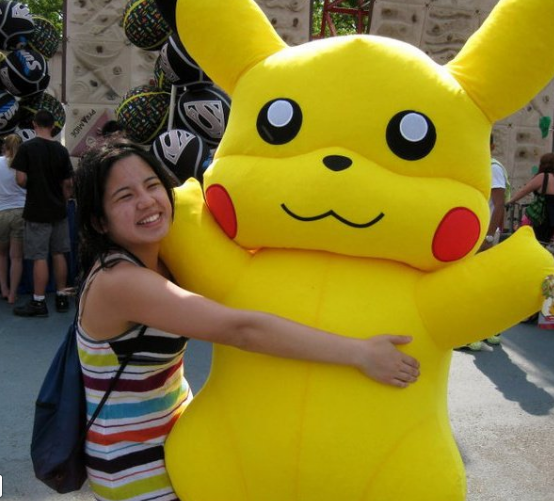 But… GIANT PIKACHU!! When I first saw this I thought that the person that was the “2-D, freckle-faced, and a poorly drawn cartoon” was Pikachu. Then I realized that there was a girl standing by the giant stuffed animal. I had a Luffy moment. But then again I am Straw Hat Luffy. One Piece is the greatest TV show of all time!! And, yes, I am including other greats like the Legend of Korra, Breaking Bad, The Twilight Zone and Fullmetal Alchemist. Oh, yeah. Great comic. It is hilarious!! Note: Everything you know, or think you know is a lie. Warning: Question Corner is not real in the sense that you should care about it. Don’t be mistaken, everything in Question Corner is real; it is just in a different universe, so you need not worry about it. Question Corner is copyrighted; we just don’t know by whom. Me: OOOHHHH!! Chocolate or cheese? Very good question. However, could this question really be answered without a proper introduction to both foods in many of their varieties? NO! It couldn’t. So, let’s bring in my own personal taste-tester!! Eiichiro Oda: What? Where am I?! HEY, IT’S YOU!! Oda: SENSEI!! I’m older than you, so you need to address me by Oda-sensei! Oda: YES!! IT IS PROPER ETIQUETTE! You should know this, since you were saying it right a few hours ago. Me: Ooooohhhh, no. It’s been way more than a few hours. We’ve been driving like this for days if not weeks. Jerry: Sir, you shouldn’t scare him like that. Or he’ll never agree to our experiment. Me: You’re right! Here, Oda-man! Eat this. Oda: What! No. I’m not eating any- (I stuff cheese into his mouth). Mmmm. That’s actually really good. What kind of cheese is it? Me: Huh. Oh, we don’t know. We just stole the stuff from various cheese companies. Scott (driver): Yeah, and the Italian mafia were surprisingly generous with their stash. Me: Okay! Let’s keep this PG-rated. You know, for the kids. Here try this, uh, “European” chocolate. Oda: Gah!! That’s stuff nasty. What is it?! Me: Oh, uh, Scott! We use the bathroom “outside”!! With, like, toilets and stuff. Me: WHAT?! No no no no no. I just felt like reminding Scott of proper restroom etiquette. I mean, who wants to be “the guy” who goes around offending people, ya know? Oda: Yes, I know. I know that YOUR ALL SICK FREAKS!! SHOULDN’T YOU PEOPLE BE IN JAIL FOR KIDNAPPING ME!! WHAT HAPPENED TO THE POLICE THAT WERE FOLLOWING US?! Me: HAHAHA!! Gotta watch out for Jerry. He’s one mean SOB with a machine gun. Oda: He killed them all?! Me: What? No. I just mean that he cries a lot when playing Call of Duty, but he’s still a really good player. Oh, yeah, try this chocolate. Me: Oh, so now you’re cooperati- OUCH! Oda: I’ll bite your hand off. Kinda like Arlong. Me: That reminds me my little brother just finished the part with Arlong and Cocoyashi Village (he really did (I mean in real life)). He loves that show so much! I’m so proud of him. (sniff, sniff). Oda: Like I said, freaks! Scott: Sorry. Yo, “You.” What’s the census. I mean, ’bout the chocolate vs. cheese thing. Me: Oh, yeah. Well, Oda-gan. Oda: You guys only gave me one of each, but I like the cheese, so, I guess I would have to choose CHEESE!! Me: There you have it folks! Eiichiro Oda’s personal choice!! CHEESE! So, when craving a late night snack go get some of that delicious yellow/white/green stuff. Hope you enjoyed Question Corner! Oda: You know, I don’t mind you using that title as much as I used to. Can I just tell you how awesome these are? Like they’re the best. This actually made my day. Actually, since the writing of this post, I’ve made up my mind. Chocolate is definitely the better choice. And chocolate ice cream is a whole new level in itself! Pretty awesome self-introduction, I’d say. Haha I try sometimes! I think the giant Pikachu really ties the whole thing up nicely. My first time here (sadly). I love you already!!!! daisuki desu!! !